This composite image shows X-rays from NASA's Chandra X-ray Observatory and optical data from the European Southern Observatory's Very Large Telescope of the galaxy NGC 3115. Using the Chandra data, the flow of hot gas toward the supermassive black hole in the center of this galaxy has been imaged. This is the first time that clear evidence for such a flow has been observed in any black hole. A supermassive black hole devouring hot gas in its vicinity has been seen clearly for the first time in a new X-ray view, according to a recent study. Black holes consume material around them and grow by using their intense gravity to pull in surrounding gases. This flow of hot gas, as it is being sucked toward the black hole, has been clearly seen for the first time in X-ray wavelengths, helping astronomers better understand how black holes gobble their surroundings and how matter behaves in this extreme environment. "It's exciting to find such clear evidence for gas in the grip of a massive black hole," Ka-Wah Wong of the University of Alabama in Tuscaloosa, said in a statement. "Chandra's resolving power provides a unique opportunity to understand more about how black holes capture material by studying this nearby object." Wong is the lead author of the new study of the black hole that was published in the July 20 issue of The Astrophysical Journal Letters. As gas flows toward a black hole, it becomes squeezed, making it hotter and brighter, something that was confirmed by the X-ray observations. 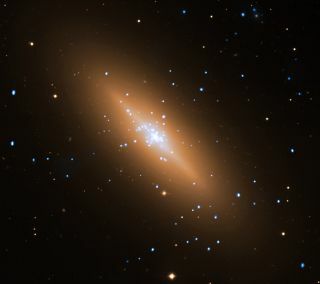 The astronomers found that the temperature of the gas begins to rise at a distance of about 700 light-years from NGC 3115's black hole, indicating the location of the Bondi radius. The new Chandra image also supports previous optical observations that suggest that NGC 3115's black hole has a mass of about two billion times that of the sun, making it the closest black hole of such an enormous size to Earth. According to the researchers, Chandra's observations show that the gas close to the black hole is denser than gas further out, as was predicted. Combining the observed properties of the gas and their own theoretical assumptions, the astronomers estimate that each year, gas weighing about two percent the mass of the sun is being sucked across the Bondi radius toward the black hole. But, there are still some mysteries yet to be uncovered. Making certain assumptions about how much energy from the gas changes into radiation, the research team would expect to find something that is more than a million times brighter when observed in X-ray wavelengths than what is seen in NGC 3115. "A leading mystery in astrophysics is how the area around massive black holes can stay so dim, when there's so much fuel available to light up," said the study's co-author Jimmy Irwin, also of the University of Alabama. "This black hole is a poster child for this problem." Two possible explanations could explain this discrepancy, the researchers said. The first situation could be that much less material actually falls onto the black hole than flows within the Bondi radius. Another possibility is that the conversion of energy into radiation is much less efficient than was accounted for in the astronomers' assumptions. Different models describing the flow of material toward the black hole make different predictions for how quickly the density of the gas is seen to rise as it approaches the black hole. Future observations should allow astronomers to narrow down and make more precise determinations using these models.